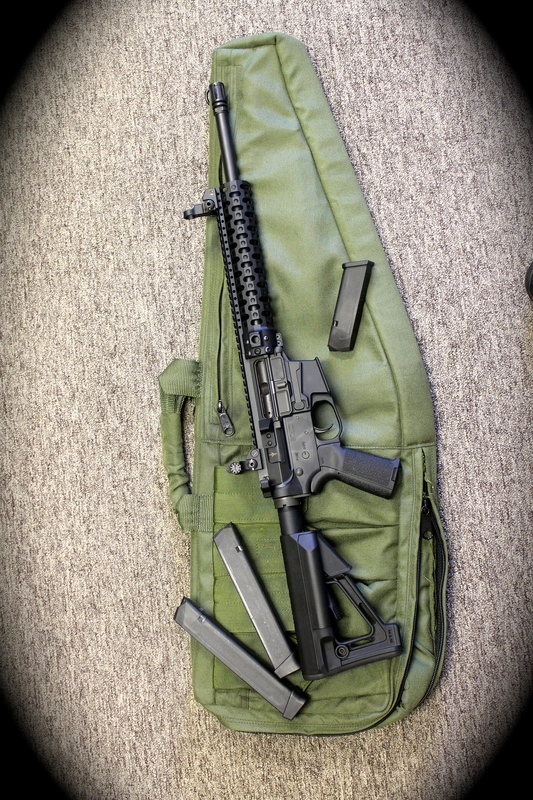 The 9mm AR-15 carbine has been growing in popularity for years and over the last year has really started taking off. Some of the growth is just for recreation since it’s cheaper to shoot than most rifle cartridges and is a lot of fun. But many shooters are starting to see it as a viable home defense weapon. While many traditionally minded shooters argue strongly against using a carbine chambered for such a small pistol cartridge for self defense, it really makes far more sense than most people realize. It is often just assumed that it doesn’t have much to offer compared to a .223, but I don’t think that’s accurate. First, let’s look at the advantages the blow back AR-15 design has over the typical gas operated design. Since it is blowback operated, there is no gas system in the gun. No gas port in the barrel, no gas block, no gas tube or gas piston. There is no separate bolt carrier and bolt, but instead there is just one, solid bolt. There is no need for a locking system since it is held in battery with just weight and spring tension. There are no locking lugs on the bolt or barrel, no cam pin, no gas rings, no carrier key. With no locking lugs, the barrel is really simple to clean. And the bolt takes just a simple wipe down and your done. No cleaning carbon out of the inside of the carrier and scraper tools for the tail of the bolt as on a traditional AR-15. It’s beauty is in its simplicity. Sure it has its quirks like anything, but when built right, a 9mm AR will run and run and run without a hiccup. Second, let’s look at the performance of the 9mm cartridge. Out of a handgun, with modern hollow point ammunition, it is a good all around pistol cartridge with mild recoil. But when fired out of a 14.5″ or 16″ carbine barrel it gains another 200-300 feet per second in velocity placing it on par with a .357 Mag or 357 Sig if not better. That’s nothing to sneeze at especially with the .357 Mag having one of the best one-shot-stop records of any handgun cartridge. Furthermore, when fired out of a longer barrel, the powder completely burns up so there is very little flash and very low noise level. It’s much quieter than a handgun and drastically less noisy than a rifle cartridge. Firing a .223 indoors can be deafening, and you likely won’t have time to put on your hearing protection during a home break-in or may not want to. So you will probably be deaf for a few days after firing your .223. With the 9mm carbine your ears will hardly be effected at all. That is a tactical advantage since you can communicate better with your family after shots have been fired. So you can use ammo common to your handgun, get .357 magnum power and have little to no hearing loss if you have to use it without hearing protection. To me, those are all very worthy considerations. But can it reliably take down an intruder? Well it won’t hit like 12 ga buckshot or a .308, but it’s not totally outclassed by .223 either. If you choose a middle of the road 9mm +P load, it will pack around 600 – 650 foot pounds of energy out of a carbine. A .223 will hit with around 1000 – 1100 foot pounds at close range from the same length barrel, but with a bullet half the size. The 9mm starts at .355 caliber and expands to well over .50 caliber in most cases, which is much larger than a .223. It also weights twice as much. So it has more momentum due to its weight and dumps energy more effectively with its larger diameter and larger expansion. In the end, the terminal performance is pretty darn good in comparison and follow up shots are fast too. And for all those who love .223 SBRs, your dreamin’ if you think they hit harder than a 9mm carbine. When you consider the 9mm carbine as a whole you get; fewer parts in the gun, less parts that can break, easier to clean, common ammo with your pistol, less expensive ammo, less expensive gun, less noise, less hearing loss, less flash, light weight, low recoil, fast follow up shots and .357 mag performance. Of course it doesn’t have a long range capability, or hit like a 12 gauge at close range, but it certainly has a lot of unique advantages. Because of this, I think we will see a growing number of high end, dedicated 9mm AR-15s targeting the self defense market instead of just the bargain formats of the past.